After a convincing victory at Hull this is an entirely different type of test. Villa have started to become the force they should be under Dean Smith and it will be a tough task to overcome them on home soil. Still, we go there with no reason to be concerned. It’s pleasing that it sounds like a decent away following will be making the short journey across the Midlands. As of 4pm on Monday only 70 tickets remained out of a total allocation of 2,602. TRAIN: As you would expect trains to Birmingham are very regular. Barring delays the 17:32 from Nottingham would still get you inside Villa Park comfortably for kick-off. Change at New Street and head to Witton which will take around 15 mins. The station is a very short walk to the stadium. The likelihood is that the first train back to Nottingham from New Street is the 22:22 which will have you back for 00:06. The cost of a return to Witton is £25.35. CAR: Certainly a much quicker means of getting home after. Options are M42 / M6 or A38. If using the M6 route then leave at Jct 6 (Spaghetti Junction); Villa Park isn’t far away at all. Whether taking the M6 or A38 you will pass somewhere close to Jct 6. The traditional route would be to head south via A38 or east as direct as you can and take what seems the quickest route towards the stadium. 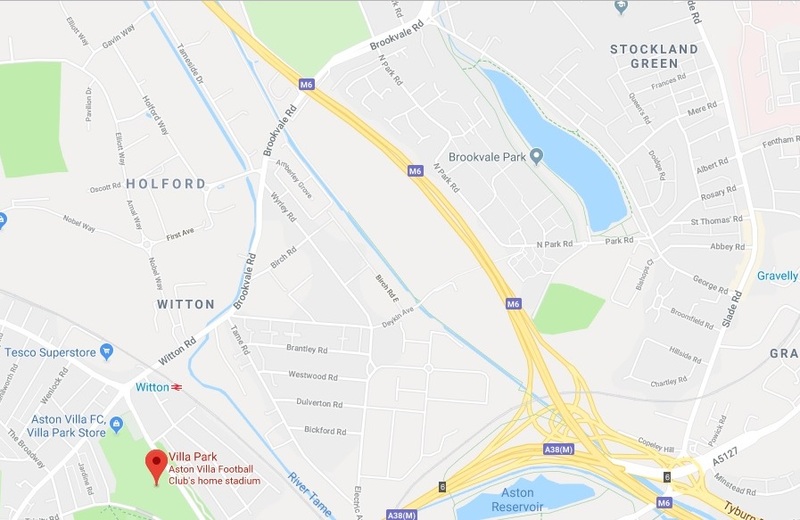 However, unless you are arriving early then I would recommend heading north off the M6 using Slade Road / George Road / Brookvale Road (see bottom right of the map below) and going around the back. Mainly because otherwise you risk getting caught up in city centre traffic flow. Having worked close to Villa Park in the recent past it’s certainly what I will be doing. Another benefit of heading this way is that you will most probably find parking a bit easier with a bit of street parking around and the get away will be quicker, especially if you are prepared to park a little bit away from the ground and have a 15 minute walk. Oh and there’s a decent chippy at the junction with George Road and Brookvale Road if you need it. Slim pickings. And those that will welcome away fans aren’t the best in my opinion. The Witton Arms is the designated away pub although it’s split in two with home fans in the front and away fans in the back, mainly in a big marquee. It’s directly across the road from Witton station and is very close to the ground. They do often charge an entrance fee of a couple of quid but whether that still happens for a midweek game I don’t know. And it wouldn’t surprise me if the Birmingham fans smashed it up when they visited on Sunday! We drank in the Yew Tree further up Brookvale Road last season. If you do take the advice above on parking up the top of Brookvale Road and walking in you’ll pass it on your left. It’s a bit of a hole and the locals didn’t look too friendly but it wasn’t busy and it served beer. A Villa supporting work colleague sings the praises of the Aston Tavern around the other side of the ground right under the A38 fly-over but there may be some issues gaining admission without a ticket for the home end. If you are on the train then don’t even consider leaving the options around New Street for one or two around the ground. You’ll regret it! 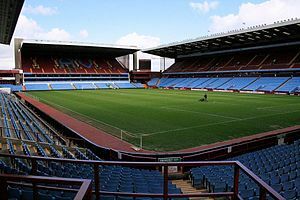 Villa fan Martyn Abrey answered our questions to provide a touch more information and to give us some background on Villa and their season so far. 1. It’s early days but how is the Dean Smith era going so far? Many of us watched on with interest as you dismantled Frank Lampard’s Derby County before the international break. It’s got the fans back on side, which I think is the main thing. A change was needed. It became so toxic towards the end of the Bruce era. There wasn’t dramatic results from the first 4 games. Improved performances (wasn’t difficult) but on the whole, 2 reasonably unconvincing home victories and 2 away defeats. So what happened at the iPro was something else! We were sensational that day. We won 3-0 but could have been 10! If that’s a sign of things to come, it could be very exciting. 2. 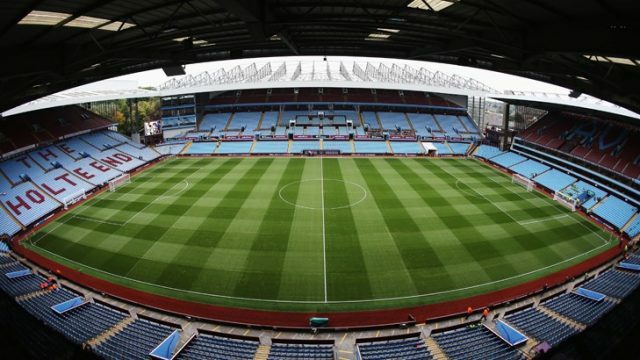 From the outside looking in you can’t help but wonder if Villa are following the path of the likes of Forest, Leeds, Derby and Sheffield Wednesday and becoming entombed in the Championship. Is the expectation amongst fans that you will get yourself back up in the near future? I think it always will be. This is our third season, so we can be under no illusions that we’re anything other than a championship club currently. However, the ambition has to be to get back to the Premier League as soon as possible. We were only 90 minutes away from doing it last season. Before the takeover, even the most optimistic of fans would have been realistic enough to gear themselves up for a tough season. However, with a new owner, new manager and strong looking squad, the expectation is back again. 3. Another similarity with at least some of the aforementioned clubs is issues at the very top of the club. Have you moved on from takeover and financial issues now? It seems that way. Early pre-season was a nightmare, waking up every morning to news of points deductions, administration and player sales. Thankfully the takeover happened and the new owners seem to have their heads screwed on and won’t gamble the club’s future on getting promoted straight away. Refusing to sell Grealish was a massive statement. I do remain somewhat sceptical regarding FFP. 4. I’ll admit that I will occasionally take a peek at the Villa line-up and see if Henri Lansbury is playing. Not only does he never appear in the starting line-up but he never seems to make the bench either. What do Villa fans make of him? to get little injuries at bad times and never managed to force his way into favour. 5. I’ve noticed that a new group have sprang up at Villa Park in recent seasons – Project B6. And there are still big crowds being drawn to Villa Park. What’s the atmosphere like there now? 6. Despite it being a Wednesday night we’ll hopefully bring a fair few travelling fans. It’s bloody crap in that away section though. I realise it’s been like that for a while now but away fans used to be behind the goal didn’t they? What was the reason for the move? It goes back to the Martin O’Neil days. I think his idea was to shove the away fans in that corner and build some atmosphere in the lower north stand behind the goal, thus improving the home form. It has improved the north stand without doubt and I guess at the time it must have worked. We were actually pretty decent back then. 7. Where can away fans get a drink before the game? Options are sparse around the ground. The Witton Arms lets in away fans and is not far from the away entrance and next to train station. Depending on time, your best options are probably going into Birmingham. The Shakespeare is right next to New Street Station. If you’ve got plenty of time to spare, could walk down to Broad Street, as obviously loads of options along there. 8. 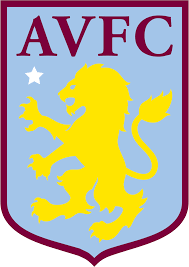 What would represent a good season for Villa? A very minimum of the play offs again. If you’d asked me in June, it would be very different. However, managing to bring in players of the calibre of Bolasie , Abraham and Mcginn, whilst keeping hold of Jack and James Chester, means it’s a very strong championship squad and shouldn’t be finishing any lower. We also now have a manager who should be able to get the best out them. We’re fortunate that after such an awful start to the season, no one has put a run together and pulled away. We’re only 4 points from the top 6 at present . If we can get through these tough set of fixtures and stay in touch going into the new year. We’ll hopefully be set for a strong second half of the season. a) Two wins against Birmingham, Villa finish mid-table and they go down? b) Two losses against Birmingham, Villa finish top six and they win the league? Blimey, that is horrible!. I’ll take the approach that we concentrate on ourselves.. and go with the latter (b) option and a chance of promotion.